e-Beam deposition is a low-energy process that locally heats the surface of the target material ("inventory") by a beam of energetic electrons. The equipment that produces and controls the electron beam is called an "e-gun." e-Guns may seem complicated, but in fact the principle is extremely simple. A hot filament is used to emit the electrons; the entire circuit with the filament is held at some negative voltage , say -8 kV, so the electrons are accelerated and strike the "inventory" (which is at ground) with 8000 eV each. This produces a local heating where the beam of electrons bombard the material. The actual beam is quite small, perhaps 3mm diameter, but a set of magnetic coils sweeps the beam across the inventory in a variety of patterns and speeds. e-guns are traditionally made of copper and have water flowing through them to carry off excess heat. Our e-gun is a Temescal SuperSource 2 with six pockets, meaning we can have as many as six different materials loaded for each coating run. Only one pocket is uncovered at a time to prevent materials from getting contaminated when other materials are deposited. We can rotate automatically to the desired pocket. (left) View into the chamber from the side viewport, showing e-gun (below) chimney baffle (center) and ion source (left, behind e-gun). In practice, the e-gun has a chimney baffle to keep the evaporated material directed toward the substrate. Our chimney is made of titanium, because it gets hot enough to melt aluminum. A shutter above the chimney keeps material from being deposited on the substrate during the initial heating to deposition temperature and to promptly stop deposition when the desired thickness is reached. A small round mirror (upper right) allows a CCD camera to peer inside the chimney so we can monitor the inventory as it is heated and deposited. (left) This image shows the e-gun in operation without the chimney baffle. We have introduced some argon into the chamber, and electrons in the electron beam collide with argon atoms and excite them, causing them to glow and showing very clearly the path of the electrons. The hot filament producing the electrons is located underneath, and a strong magnetic field bends the beam into the circular shape seen here. 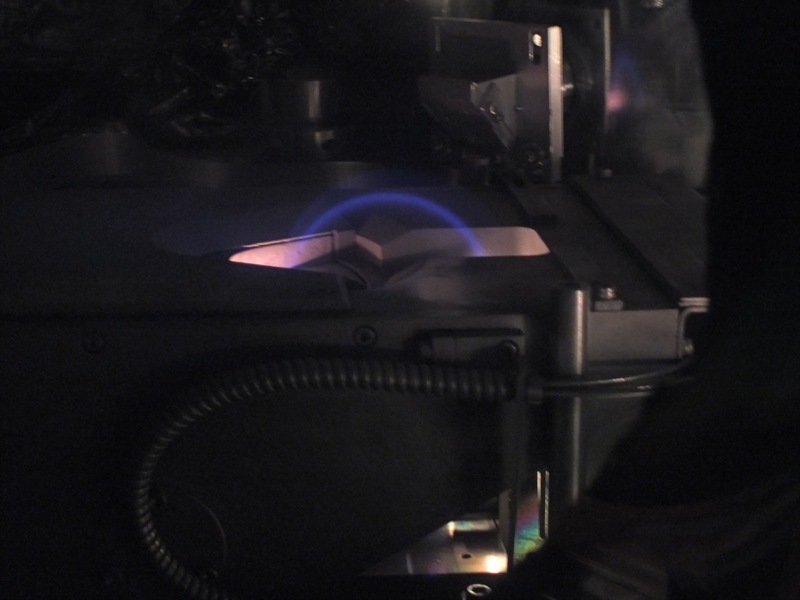 The electron beam curves up through an opening in the e-gun on the right (where the glow from the hot filament can be seen) and hits the inventory on the left (where the glow from the heated inventory can be seen). Here is a short movie of Tantalum in the e-gun [NB: 92MB file]. 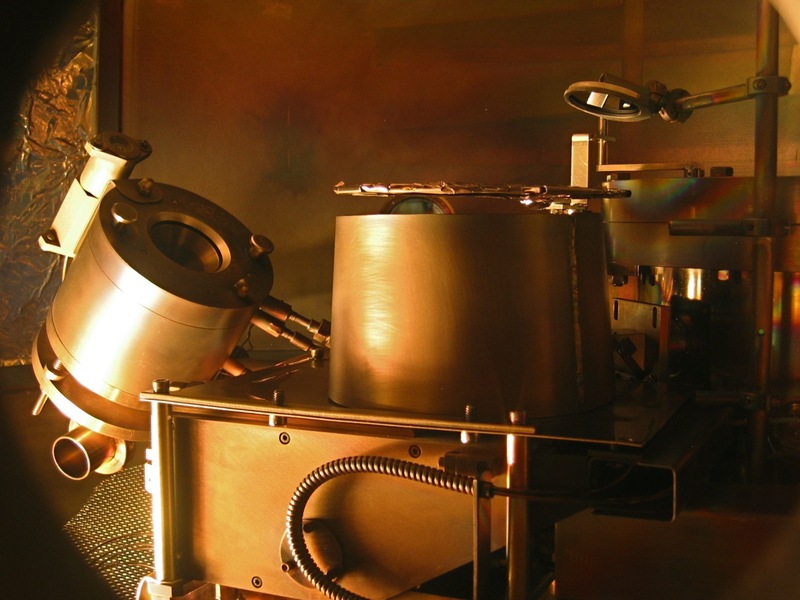 Tantalum melts at a very high temperature; only the surface right under the e-beam melts. The movie shows the process from start to finish. The CCD camera requires neutral density filters to attenuate the light by 10,000 to prevent saturation. The Advanced Coatings Lab has received National Science Foundation support via Award AST-1005506. NSF is not responsible for the content of this website.